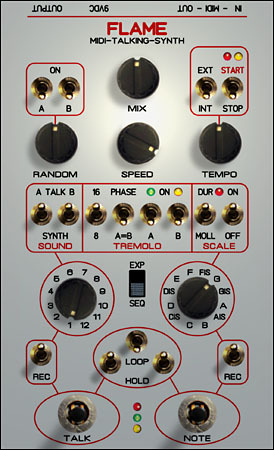 The FLAME MIDI TALKING SYNTH is a small-sized MIDI-controlled sound module based on the analogue Speakjet ™ chip, produced by the U.S. company Magnevation LLC. Originally designed for basic artificially generated speech output in American English tongue it was then refined and further developed as an 8-bit sound module with speech-like sounds and synthetic robot voices as well as beeps, alarms, noise and retro-style sci-fi sounds. Due to the structure of the Speakjet ™ (with its complex sound synthesizer, preset sounds and serial interface) it offers an impressive range of possibilities. It contains 72 speech elements (allophones), 43 sound effects, and 12 DTM touch tones. The idea was to create sounds, patterns and sequences in the 8-bit style of the 80s or other retro sounds for making music instead of just simulating speech. Most allophones can be tuned and used tonally. The FLAME MIDI TALKING SYNTH contains two Speakjet ™ chips to produce a richer and more complex tonal variety as well as generating a pseudo stereo effect. Since the Speakjet ™ has not originally been laid out for the purpose of making music it is actually not fully controllable via MIDI input, i.e. : once sounds are triggered they cannot be directly stopped by Note Off messages from a MIDI keyboard or a sequencer. Thus a MIDI-controlled audio tremolo has been implemented in the FLAME MIDI TALKING SYNTH virtually allowing MIDI control and enabling an easier integration into a MIDI setup. The FLAME MIDI TALKING SYNTH lets you play back preset words in its EXPANDER mode via an external MIDI keyboard or a sequencer. In addition you can use the FLAME MIDI TALKING SYNTH as a stand-alone MIDI controller since all controls and joysticks send MIDI control/change data to the MIDI-OUT connector.